When one thinks of the treasures of the Folger Shakespeare Library, books and manuscripts and artwork immediately come to mind. But for many, the library's national landmark building—designed by Paul Philippe Cret (1876–1945)—is a high point. Located a block from the US Capitol, the Folger Shakespeare Library is an Elizabethan monument with a neoclassical exterior. On the outside, its white marble harmonizes with nearby buildings, such as the Library of Congress, the Capitol, and the Supreme Court. Inside, the design evokes Tudor England, with oak paneling, ornamental floor tile, and high plaster ceilings. The Folger building is best known for the Shakespeare bas-reliefs along its north façade. The building is extensively ornamented with inscriptions of quotations by and about Shakespeare. Quotations were often used to adorn English great houses of Shakespeare's day, and are an essential part of the Folger's architecture. Henry Folger personally selected the inscriptions that may be found throughout the interior, the exterior, and the grounds. It was his wish that any texts taken from the 1623 First Folio of Shakespeare should be spelled as they appear there, rather than in the modern style. The chief architect for the Folger Shakespeare Library was Paul Philippe Cret, a well-known Philadelphia architect and French emigré who had trained in the Beaux Arts tradition in Paris. Some of his previous projects included the Pan American Union in Washington and the Detroit Institute of Arts. Washington architect Alexander Trowbridge was the consulting architect for the project. 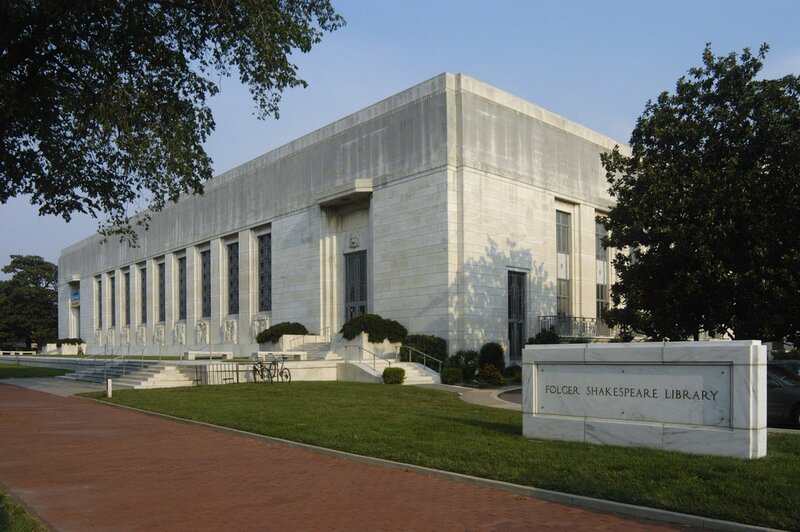 The Folger Shakespeare Library was dedicated in 1932 and is listed in the National Register of Historic Places. The exterior of the Folger Shakespeare Library is clad in white Georgia marble and ornamented with Shakespeare bas-reliefs by the New York sculptor John Gregory (1879–1958). By convention, this artwork would ordinarily have been positioned much higher, near the top of the building; the Folgers asked for the placement near street level to give the public a better view. Flanking the bas-reliefs are the library’s two front doors, placed at the east and west ends of the wall. Beside the stairs leading to the doors are carvings of the winged horse Pegasus, who released the spring waters of the Hippocrene fountain—source of poetic inspiration—with a blow of his hoof. Masks of Comedy and Tragedy appear above the doors and on the windowless east side of the building, overlooking the Elizabethan Garden. The Folger represents a very early use of aluminum in architecture. You can see it in the Art Deco grilles on the front doors and the tall windows above the bas-reliefs, and in the grilles and balcony balustrade on the west wall. The balustrade’s design incorporates the Shakespeare family coat of arms. 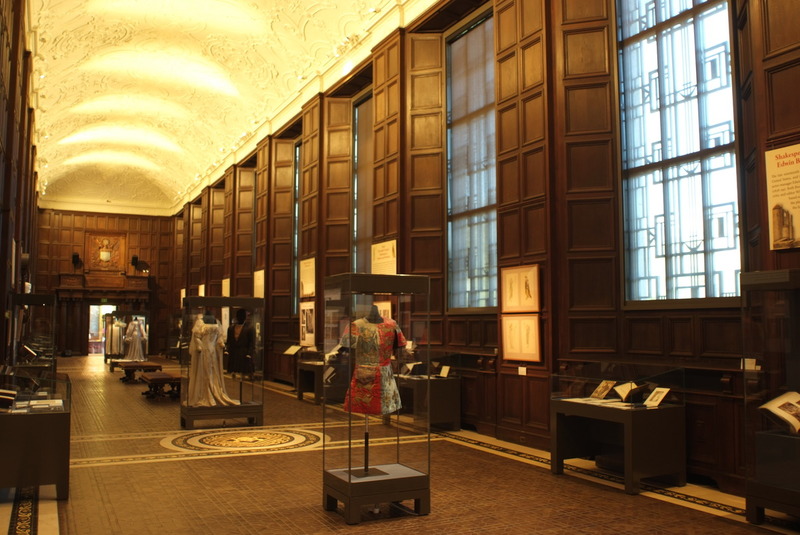 The site of two to three exhibitions a year, drawn primarily from the Folger collection, the Folger's Great Hall evokes the gallery of a 16th-century house with its soaring plaster strapwork ceiling and oak-paneled walls. The terracotta floor incorporates masks of Comedy and Tragedy as well as the titles of Shakespeare's plays. The First Folio of Shakespeare is on permanent display, as is a white marble memorial bust of Henry Folger produced by John Gregory, the same artist who created the Folger's exterior bas-reliefs. The shield and great eagle of the United States grace the west end of the hall, nearest the Capitol. The coat of arms of Elizabeth I, Shakespeare's queen, represents Great Britain at the east end. Each heraldic device is accompanied by a quotation from a theatrical giant—respectively, the American drama critic William Winter and the British thespian David Garrick. 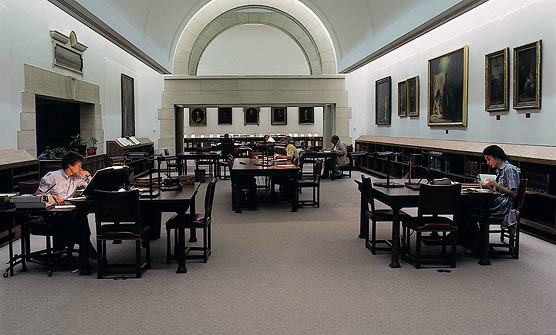 Just off the hall is an additional space, the Shakespeare Gallery, established in the 1990s with the help of the Lila Wallace–Reader's Digest Fund. The Shakespeare Gallery offers a visitor orientation video and a multimedia exhibition of highlights from the Folger collection. The intimate Elizabethan Theatre is the setting for Folger Theatre productions, early music concerts by the Folger Consort, PEN/Faulkner readings, Folger Poetry programs, family activities, and many education programs, including the Folger’s student performance festivals. With its three-tiered wooden balconies, carved oak columns, and half-timbered facade, the Theatre evokes the courtyard of an English Renaissance inn. Overhead, a canopy represents the sky. In Shakespeare’s day, such inns sometimes served as playhouses for traveling groups of players, who performed on a raised platform at one end while spectators gathered in the yard and on the balconies above. In the lobby just outside the Theatre, visitors are greeted near the door by a marble statue of Puck, Shakespeare’s mischievous sprite from A Midsummer Night’s Dream. This is the original statue created for the Folger grounds by the award-winning sculptor Brenda Putnam in 1932 and restored in 2001. Today, an aluminum replica presides over the Folger’s outdoor fountain. Built like the great hall of an Elizabethan house, the 131-foot Gail Kern Paster Reading Room incorporates 16th- and 17th-century French and Flemish tapestries, carved oak paneling, a high trussed roof, and a large fireplace. 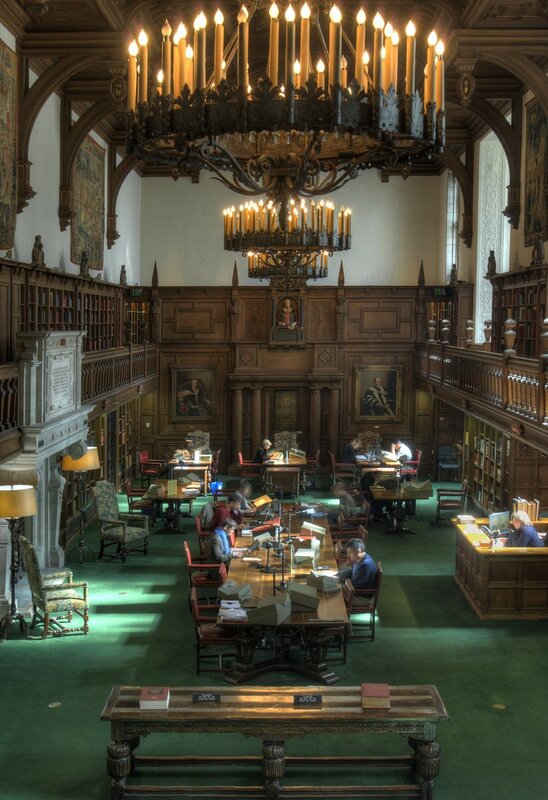 Its name was changed from the Old Reading Room to the Gail Kern Paster Reading Room in 2011, in honor of retiring Folger Director Gail Kern Paster. On the hall screen at the east end hang portraits of the Folgers in their academic robes, painted by the British artist Frank O. Salisbury. Above the Salisbury portraits is a bust of Shakespeare based on his memorial in Holy Trinity Church, Stratford-upon-Avon. The ashes of both Folgers are immured behind a memorial plaque. 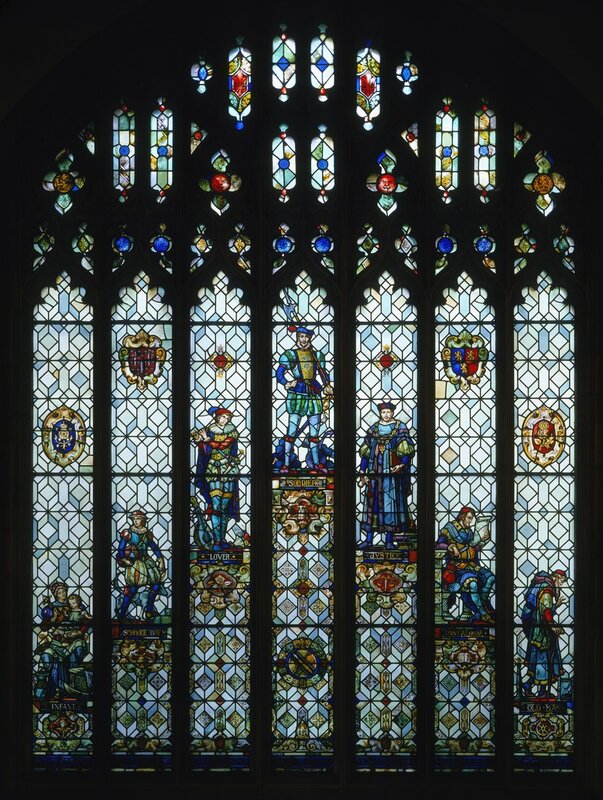 At the west end is one of the Folger's treasures, a large stained-glass window depicting the Seven Ages of Man from Jaques's speech in As You Like It. The Paster Reading Room is devoted to scholarly research. It opens to the public for tours on Saturdays and for Shakespeare's Birthday Celebration in April. Located at the west end of the Gail Kern Paster Reading Room, the Seven Ages of Man window is by the Philadelphia stained-glass studio of Nicola d'Ascenzo (1871–1954). D'Ascenzo's numerous other works include windows at the Washington National Cathedral, the Yale and Princeton university chapels, and the memorial chapel at Valley Forge. Although the Folger window he created is exposed to exterior sunlight, it is in an interior space and is not visible from outside the building. At Henry Folger's request, D'Ascenzo modeled the stone tracery of the window after the apse window of Stratford's Holy Trinity Church. The stained glass within the stonework depicts the Seven Ages of Man that Jaques describes in As You Like It. Constructed in the early 1980s as a modern complement to the original Reading Room, the award-winning New Reading Room is topped by glass panes that admit indirect daylight and its long walls are filled with paintings from the Folger's large Shakespeare collection. Wooden pillars leading from the old room into the new room and high, stone-trimmed arches reflect the Renaissance spirit of Paul Cret's original design. The New Reading Room, designed by Warren Cox of Hartman-Cox Architects, honors Theodora Sedgwick Bond and William Ross Bond, for whom it is a memorial. 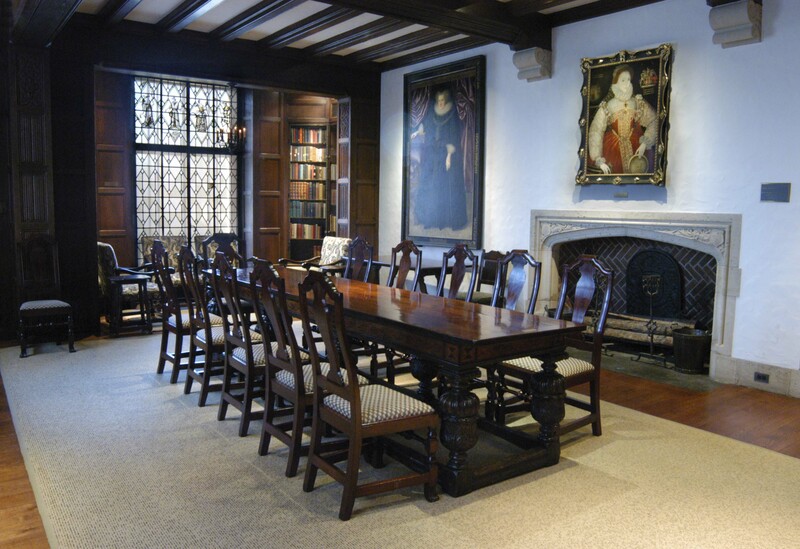 The Founders' Room was originally designed as a private space for the founders of the library, Henry and Emily Folger. Today it serves as a meeting room and display space. Opaque leaded-glass windows, carved paneling and beams, antique furniture, and a stone fireplace create a Tudor atmosphere in the Founders' Room. Figures in the windows represent Shakespearean characters, among them Julius Caesar, Richard III, Hamlet, Cleopatra, and Ophelia. The curio cabinets hold changing displays of materials related to the Folgers and their collection. The Wyatt R. and Susan N. Haskell Center for Education and Public Programs is located just across Third Street from the main building. 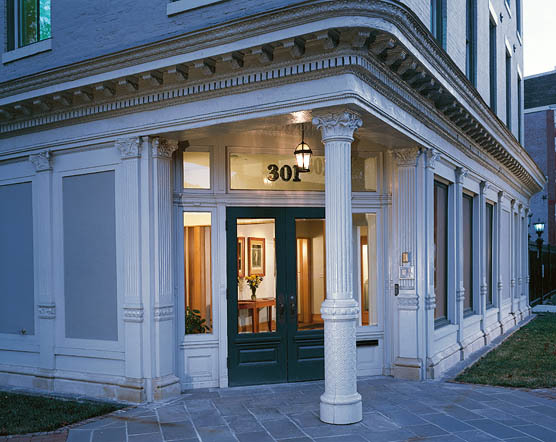 Dedicated on February 25, 2000, the center houses a lively variety of Folger activities, including the Folger's K–12 education programs and administrative offices for the Folger Theatre, Folger Poetry, and Folger Consort, and the docents. Among other amenities, it offers the Foulke Room, a large, window-filled room for seminars, meetings, and rehearsals; the Cafritz Foundation Center for Distance Learning; and office and meeting space. Architect Andrew Stevenson faced several challenges in converting a 19th-century office building, formerly a funeral parlor, into this modern workspace. Among these difficulties was a basement less than six feet deep. As part of the project, the existing building was underpinned while a new bottom floor was excavated, creating a functional lower level that became one of four usable floors. The Elizabethan Garden is inspired in part by herbal references in Shakespeare's plays, but it also incorporates plants that were simply popular in his time, such as lavender, creeping thyme, and English ivy. This special area, opened in 1989, includes a knot-shaped formal garden as well as flowerbeds, trees, hedges, and benches. It was created through the generosity of Mrs. Poe Burling, Dr. and Mrs. Timothy Childs, and Mr. and Mrs. Cabot Sedgewick, along with many friends. The armillary sphere in the center of the garden, a memorial to former Folger director O.B. Hardison, serves as both a garden ornament and a sundial. The entrance to the garden through a wrought-iron fence was given in memory of Michael D. Valentine, a former employee. 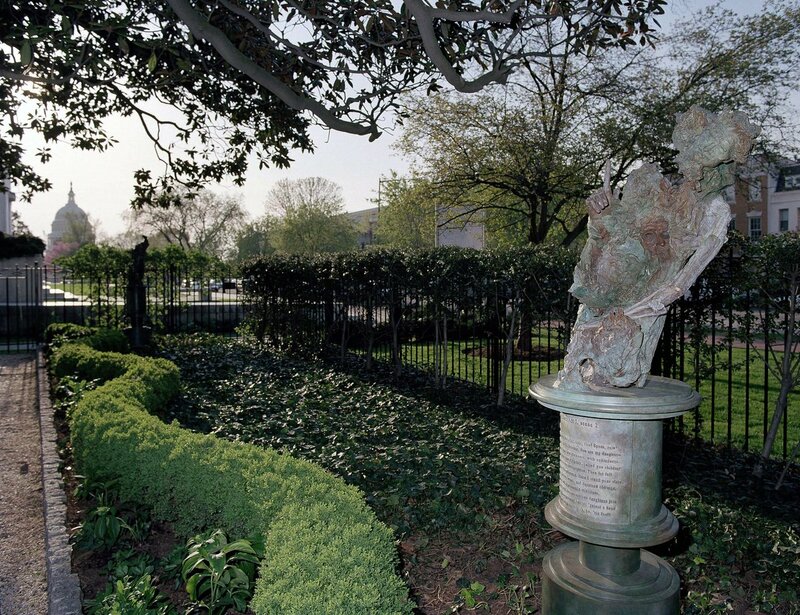 In 2003 and 2004, the Folger grounds added works by Greg Wyatt evoking the characters and themes of eight of Shakespeare's plays: The Tempest, Julius Caesar, King Lear, Hamlet, Twelfth Night, A Midsummer Night's Dream, Henry IV, Part 2, and Macbeth.